Outfield isn't the deepest it's ever been, but it's never lacking in breaking and sleeper candidates, according to Scott White. Outfield may appear thin at the top this year, but rest assured there are enough to go around. Quite simply, too many exist for a true shortage to develop. With roughly 90 players holding the job at any point in time, the number of candidates to step up and fill the mix-league void is virtually endless. Where I worry most is the shallower leagues, the ones where I may be starting a "good" player in a broader sense but still be at a disadvantage compared to the rest of the league. It's only a starting point, though, and chasing the hot hand on the waiver wire will eventually uncover something better. Who at this point a year ago was targeting Juan Soto, David Peralta or Brandon Nimmo? Even Michael Brantley and Aaron Hicks were late-rounders at best. Shoot, there was a four-month stretch when Nick Markakis was elite. Granted, you'd rather leave yourself with one hole than three, but as my outfield tiers show, you're already settling for less than elite production by the end of Round 2. And from there, it's a quick drop to Lorenzo Cain/Tommy Pham territory. It's those middle tiers where the position really shines. 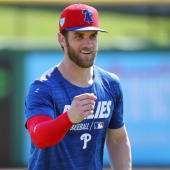 Even if you spend the first couple rounds focusing on first basemen or starting pitchers or whatever else, it won't take much effort to come away with two or maybe even three outfielders from the 16-40 range, which is probably good enough considering the number of interesting outfielders you'll be turning down as the season unfolds. Just a starting point, remember. To me, it's a relatively low-stress position. The talent gets distributed in a way that feels natural, with little sense of urgency. As long as you're not consciously avoiding it, you'll probably be satisfied with the way it turns out. In fact, I feel greater anxiety thinking about some of the upside plays I may have to forgo by filling my outfield spots too early. But of course, if I'm picking first or second, I'm beginning my team with an outfielder, whether Mike Trout or Mookie Betts, and if it works out that I draft J.D. Martinez in the middle of Round 1 or Christian Yelich at the end, so be it. The one I might refrain from taking at his going rate is Ronald Acuna, who may well perform like a first-rounder, but we're basing those expectations on what he did over the final two months of his rookie season, which isn't the most reliable test. I think it's mostly a product of how desperate we are for another masher who steals bases, but I'm not confident he's going to be a significant source of those anyway, especially given the talk of him moving out of the leadoff spot. The outfield is where you'll find most of your stolen base help, though. It makes Trout and Betts easier calls at the top, helps safeguard against the risk of Christian Yelich falling short of MVP-level power numbers and pushes fairly ordinary hitters like Starling Marte and Whit Merrifield into Round 3. It has Victor Robles high on breakout lists and grants Pham the benefit of the doubt again after a tumultuous 2018. But a couple of big base stealers may not actually be getting the attention they deserve. Mallex Smith was one of just three players to swipe 40 last year and figures to bat leadoff for the Mariners this year. Billy Hamilton used to be the preeminent source of stolen bases, going off the board as early as Round 4 in Rotisserie leagues, and is now with a Royals team that's offensive game plan is built around the stolen base. Granted, neither offers anything in terms of power, but if you miss out on the big steals sources early, having those two available in Round 10 and beyond is a nice luxury. Jesse Winker. The on-base freak who began to find his power stroke in the six weeks leading up to shoulder surgery last season has a batted-ball profile virtually identical to Joey Votto, which is the most flattering of hitter comparisons. George Springer. With only one 30-homer season to his name and a swing that isn't built for batting average either, it's possible the ceiling we keep drafting Springer for just doesn't exist. Jake Bauers. As a 22-year-old, he had a 13.9 percent BB rate and a 40.5 percent hard contact rate. Yoenis Cespedes. You don't need to draft him in a standard points league, and only in the reserve round in Roto.